This article is about the year 1970. 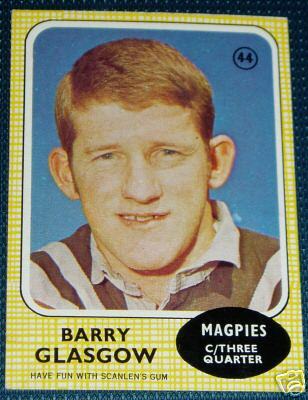 Ned has left as well as Barry Glasgow and Nev Hornery to name only two.﻿ Mick Alchin hurt his knee in a preseason game against Wenty and missed the rest of the year. It was a very long season for all concerned. It was also the year that Greg and I could drive the "Magpie Morrie"
to Lidcombe Oval and beyond. This photo was taken before color. The turrent is white and the body of car is black. The Morrie was spraypainted by my brother Paul Lewis. Photo taken by David Cook. 1970 was also the year my favorite cartoon Boofhead finished. This cartoon appeared in the Sydney Daily Mirror between 1941-1970. Below is the Gains and Losses Chart for 1970. Noel decides to hang up his boots after a very long and brilliant career. The new Coach Ron Watson. Barry is one of the Kellys Kids leaving. The Berries are buying everybody. 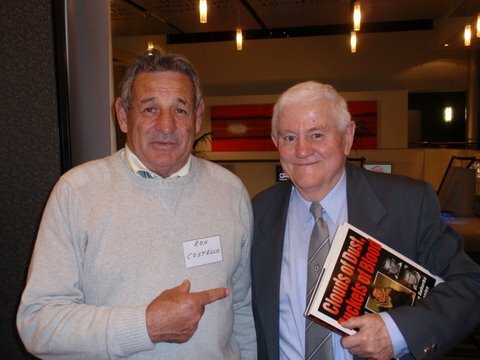 Ron Costello and Ben Fisher at a recent Pratten Park reunion. Maybe Ned could of bought this little beauty with his HUGH sign on fee. The 1970 season starts at last. In 1970 two teams from the Second Divison played in the Pre Season Comp. Wenty and Uni were the two top teams from 1969. Wayne Merry was signed to play for Wests from Wenty. Of course the real game was being played at White City. Big Tony Antunac playing his first game with Wests. Big T about to pounce @ Liddy Oval. Steve Knight and Ivan Jones @ 2011 Pratten Park Reunion. Who is Peter Timbs ?? or did they mean Kevin Timbs?? Two Ex Magpies in the Forwards. Nev Hornery and Ron Costello. Wests lost 14-29 another close one. Thats Nev tackling Gary Stevens @ SCG. Who can ever forget The Raindrop Fountain @ Roselands. Wests lost 16-32 in a close game. As a 17 year old this was the car for me. Maybe the Betty and Phil drove this car to the SCG. Is that a MAZDA coming 3rd?? Ivan Jones first first grade game with Wests? Ivan Jones at the COM reunion Feb 2014. Someone forgot to tell Nev. Very big story at the time HAIR and its length. This was a couple of years before Russell Fairfax at Easts!! Dont like those HIPPIE TYPES. Ron Raper looking like one of his brothers. Its all over for Filipino Rapalo and The Old Tin Shed. Thats Barry Bryant showing Louis Newman the turf at Liddy Oval. A good result in 1970. But a very small crowd of 1527. A little hard to read but worth it. A very good story . Not much has changed in Rugby League. Look in the ROUND 15 RESULTS. Big upset Wests defeat Easts 25-9. I think I will pop down to Chapmans at Rockdale for my 90 cent ticket. The seasons coming to the end. 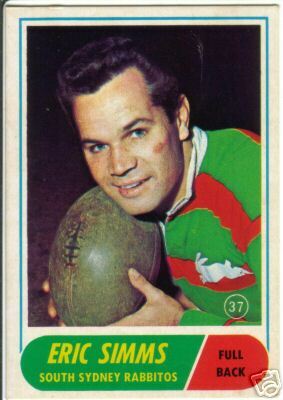 Souths go on to win the 1970 Premiership. The player who changed the value of a field goal from 2 to 1point. Along with Wests Barry Glasgow. Small write up for a good win over Penrith at home. 12 months early this was the scene of Neds last game. I guess this FINAL TABLE says it all. Below is the full details for 1970.